Making Tax Digital (MTD) is part of the UK government’s plan to make the country’s tax system more efficient. It’s first stage comes into effect in April. You only need to pay attention to MTD in 2019 if you are based in the UK, registered for VAT, and use Light Blue’s VAT return report. The scope of MTD will be widened in the future, but it’s very limited at the moment. HMRC will require businesses to start submitting their VAT returns via compatible software from April 2019. However, that doesn’t mean that you have to use just one piece of software to manage your company’s finances: so long as you use “digital links” to transfer data between applications or to your accountant, MTD allows you to use a variety of tools. HMRC explicitly list CSV data exports and imports as an acceptable form of “digital link”, which means that Light Blue’s existing data export tools comply with MTD’s requirements. If you’re already using Light Blue’s VAT return report, we will be in touch with you in the next few days to help you get ready for MTD. If you’re not using Light Blue’s VAT return report, you can probably carry on using Light Blue’s invoicing and other finance features just as you are at the moment because you can use our data export tools to maintain a “digital link” between Light Blue and accountancy software. As always, if you have any questions or need any help then please get in touch with us via email! We’ve released Light Blue 8.0.3, which is another free update to everyone who subscribes to our online services or has bought Light Blue 8. You can now use the “Add To Found Set” section of the Records menu to add a Resource to a selection of records, and the “Remove From Found Set” section to remove a Resource from a selection of records. Our QuickBooks invoice export now includes the invoice due date and the linked shoot’s title and shoot type. The “Tidy Popup Menus” housekeeping command now allows you to tidy the purchase item Name field. Added .cr3 and .raf file extensions to the list of unprocessed file extensions supported by our picture renaming feature. The background activity window no longer contains an item unhelpfully labelled as “Description” when you first open it. Updated the printed version of workflows to show email and text message steps correctly. On Windows, the staff login dialog now focuses the password field when it opens to save you needing to click or tab into it. Fixed a problem where charts section could fail to take percentage discounts into account. Fixed a problem with the “Staff Shoots” report that prevented shoots from being included more than once if multiple staff are assigned to it. Enquiries and cancelled shoots are no longer included in the report. Fixed a bug that could cause macOS contacts to be published to an account other than the default account. Fixed a database error message that could appear when using the Sales list view with both the Photographer and Salesperson columns. Fixed extra text that could appear when printing a contact record. Fixed a bug that could cause an attachment to be duplicated when sending emails in quick succession. Fixed a printing problem that could cause the rightmost column to be cut off the Purchases section of a tax report. Fixed a bug that could cause unsaved changes to be lost when dragging an attachment into an email. Fixed a problem with updating workflows when upgrading from an early Light Blue 8 beta. Fixed a problem where setting a custom label for a contact method wouldn’t display that custom label until you enter the phone number or email address. Fixed a couple of unexpected quits that could occur in unusual circumstances. We hope that 2019 is going to be full of happiness and success for all of our customers, and that enquiries have been coming in thick and fast over the Christmas and New Year period. Light Blue is full of tools that can help you respond to and follow up on those enquiries, quickly confirm bookings with your new clients, and get your invoices paid quickly. We’d love to help you get the most out of those tools! We’re always keen to make sure that you’re getting as much as possible out of Light Blue, and you’ll find loads of helpful resources on our website: excellent video tutorials, in-depth webinars, and responsive email support. We also offer one-to-one training via screen-sharing software, which allows us to offer personalised help to make sure that you’re getting the most out of Light Blue. Whether you need a hand with setting up a particular feature, or want to ask our advice about how to approach a particular situation, we’ve got experience of working with thousands of photographers around the world. We’re offering all of our customers a free 30 minute screen-sharing session. All you need to do is book your one-to-one session by the end of February! Click here to book a free screen-sharing session! Light Blue 8 is a major upgrade to our desktop app. We’ve added new automation features and made lots of improvements to Light Blue’s email and text messaging features, helping you to book more shoots, cut down on no-shows, and free you up to spend more time on delivering great images to your clients. We’ve also added new features to Light Blue’s client portal, and lots of other changes that will help you to run a successful business. Read on to find out more about the big new features in Light Blue 8, or click here to see them in action on our video tutorials page! Light Blue 8 introduces some big improvements to our workflow features that allow you to automate the routine emails and text messages that you send. For example, shoot and appointment reminders or enquiry follow-ups can now be set up in advance and automatically applied to your shoots and contacts. 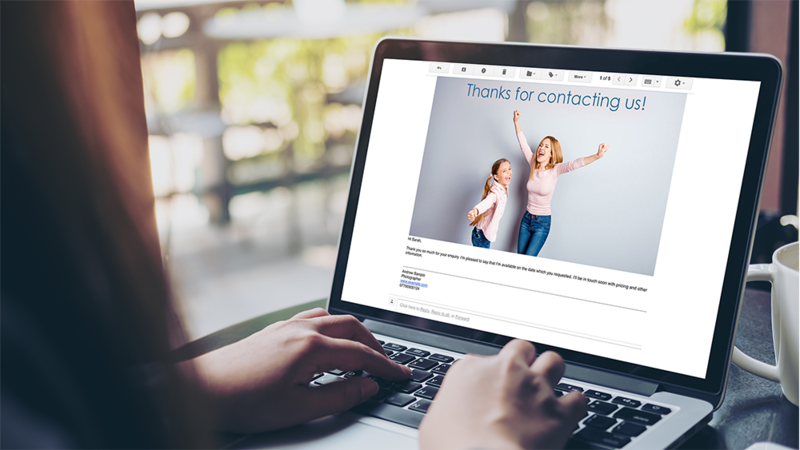 Photographers love Light Blue’s online contract signing and forms features, and now our forms are even more helpful because you can use them to ask your clients to upload images or files to you. If you’re doing in-person sales, you could use this feature to ask your client to send you a photo of their living room before a viewing session. If you’re photographing a wedding, you could ask the couple to send you a copy of the spreadsheet that they’re using to organise their wedding day. Or, if you’re organising a corporate photography job, you could ask your client to upload their brand style guide. Sending emails and text messages is much faster because they are now sent in the background, freeing you up to carry on using Light Blue while they’re being sent. Emails can now be composed in a separate window, allowing you to compose multiple emails at the same time or carry on using other parts of Light Blue while you’re composing an email. Light Blue 8’s email and text message features have received a lot of tweaks and improvements to make them faster and more convenient to use! Light Blue 8’s workflow improvements go beyond our new automated message features, with enhancements that make them both easier to use and more flexible. We’ve also made it possible to export and import workflows, which allows you to share a workflow with someone else or import one that someone else has shared with you. Light Blue doesn’t rely on a fast internet connection, so you can use it when you’re offline or only have a slow internet connection. That means that we can make our apps really fast, and we found a couple of new ways to make Light Blue 8 even quicker than previous versions: upgrades that require a database upgrade are now 20x faster, and the Inbox and Outbox load a lot faster for studios that have tens of thousands of incoming or outgoing items. Behind the scenes there are hundreds of tweaks and refinements to make Light Blue faster, better and more intuitive. You can read the full release notes here. Subscribers to Light Blue’s online services can update to Light Blue 8 by using the ‘Check For Updates’ command within the Light Blue desktop app. If you already have a Light Blue licence, but don’t subscribe to our online services, the best way of upgrading to version 8 is to add a subscription. As well as being able to upgrade for free, subscribers have access to Light Blue’s most popular features, including our online contract signing service, forms, online invoices, and enhanced email and text messaging features. * Some of Light Blue 8’s new features require a subscription to our online services. Light Blue 8 is a major upgrade to our desktop app. We’ve added new automation features and made lots of improvements to Light Blue’s email and text messaging features, helping you to book more shoots, cut down on no-shows, and free you up to spend more time on delivering great images to your clients. Read on to find out more about the new features that we’ve added to Light Blue 8! Light Blue 8 introduces some big improvements that allow you to automate the routine emails and text messages that you send. 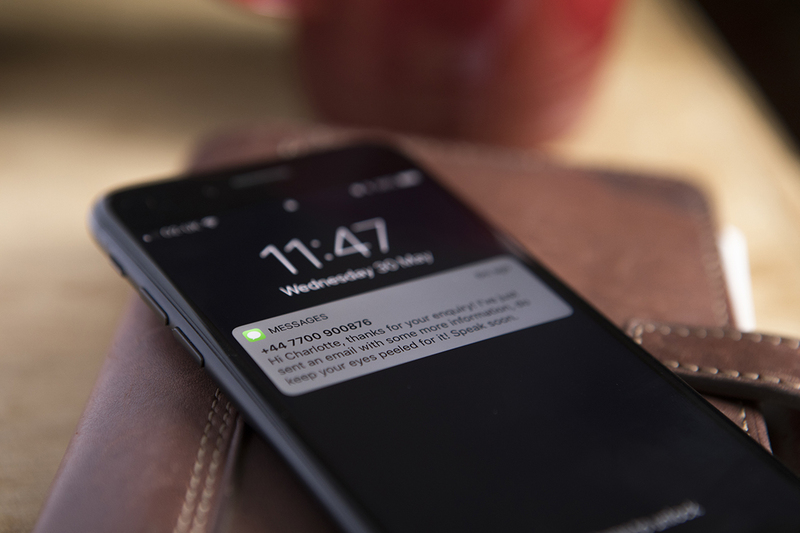 For example, shoot and appointment reminders or enquiry follow-ups can now be set up in advance and automatically applied to your shoots and contacts. We’ve achieved this by allowing you to include emails and text messages in your workflows. 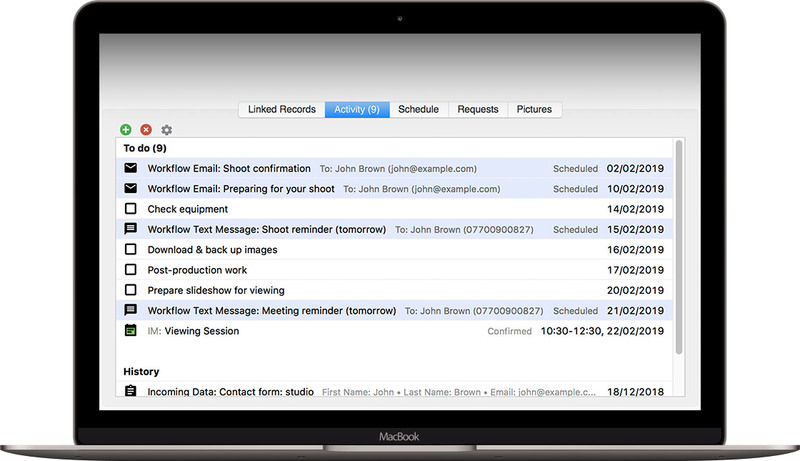 Workflows could already include tasks and appointments, and you can now include templated emails and text messages. You have control over when your automated messages will be sent by telling Light Blue how many days before or after a shoot, enquiry, etc, you want them to be sent, and at what time of day they’ll be sent out. You can preview your workflow messages, and you add your own personalisation or customisation to your automated messages as well as using Light Blue’s flexible mail-merge tags. Workflow messages are automatically rescheduled if the date that they’re based on is changed (e.g. if a shoot is rescheduled). If you’re using automated messages as part of an enquiry workflow (e.g. to send follow-up messages to your clients), they’ll be automatically deleted when you either confirm or cancel the shoot. If you need any help setting up your workflows, get in touch and we’ll be delighted to help you get the most out of them. Workflow message features require Light Blue 8. If you add a workflow, reschedule, or change the status of a shoot from an older version of Light Blue, workflow messages might not be handled correctly. If you’re going to use workflow messages, please update all of your computers to Light Blue 8. Support for workflow messages has also been added to our mobile app. If you’re using the Light Blue mobile app, please update to version 4.3 via the App Store. You can use most of Light Blue’s mail-merge tags in workflow messages, but a few of them aren’t supported. If you use any mail-merge tags that aren’t supported in workflow messages, you’ll see a warning in Light Blue. Sending emails and text messages is much faster because they are now sent in the background, freeing you up to carry on using Light Blue while they’re being sent. Emails can now be composed in a separate window, rather than in a dialog box. This allows you to compose multiple emails at the same time, or carry on using other parts of Light Blue while you’re composing an email. You can now use one of your email templates when you’re replying to an email. You can easily add contacts’ email addresses to an email by clicking the new + buttons that appear next to the To, CC, and BCC fields. We’ve added a reply-to field for emails sent from Light Blue. Text messages are now included in the Outbox. The number badge on the Outbox shows the number of draft messages and messages that have errors. It’s shown in grey if there aren’t any errors, or red if there are any errors that need your attention. On macOS, Light Blue’s dock icon now shows you the number of items in the Inbox that need your attention. If you’re using the “Pending Items & Unread Messages” filter in the Inbox, marking an email or text message as read no longer makes it disappear straight away. It will only get hidden when you reload the Inbox or change your filters. The “go to linked record” contextual menu command for emails in the Inbox now includes any contacts that Light Blue has automatically recognised based on the sender’s email address. We’ve improved how timezones are handled when you manually schedule an email or text message to be sent in the future. Images in emails can now have alt text. When you reply to an email that included attachments, you now have an option to include those original attachments in your reply. Fixed a problem where adding a signature to an email reply could put the signature below the quoted text. When emails or text messages are sent or scheduled, their status in the Activity panel now updates as soon as it happens. You can now export or import workflows, which allows you to share your workflows with other photographers or import a Light Blue workflow that someone else has shared with you. Added “Add Workflow” buttons to shoot sessions (instead of making you go into the session’s options menu to add a workflow to it), custom date fields, and the appointment date field. When you click an “Add Workflow” button for a field that allows you to specify a default workflow (e.g. the shoot enquiry date), instead of only allowing to add that default workflow the “Choose Workflow” dialog is now presented and the default workflow is pre-selected for you. This means that you just need to click the “Add” button if you want to use the default, but can select an alternative workflow if you want to. The “Add Workflow to Found Set” menu command now allows you to add workflows to shoots based on their start date or enquiry date. Any shoots in the found set that don’t have your selected type of date are skipped. You can now set a default confirmation workflow for appointment types. Added a “Today” option to the list of key dates you can base a workflow on. The “Custom Date” option already defaulted to today, but this new option will provide a more understandable option. Changed the “Delete Outstanding Tasks” command from the Activity panel options menu to “Delete Outstanding Items”. This will delete uncompleted tasks and unsent scheduled emails and text messages, but leaves any future appointments. When you change the status of a shoot from “Confirmed” or “Completed” to “Enquiry”, Light Blue now offers to tidy up outstanding items (in exactly the same way as when you cancel a shoot). You can now reassign multiple tasks to another member of staff from the Task Manager, or change their category. Added an “Assign Workflow Tasks Without Allocated Staff To Logged In User” preference to the “General Preferences” section of the Preferences. Shoot and contract forms can now include image and file upload fields. You add these to your form or template like any other field (although they can’t be included in contact forms, mostly for security reasons) and clients can use them to upload an image or file to you. If a client uploads a file to you, the filename will be included in your notification email and in the Inbox, and the uploaded file will appear in the shoot’s Activity panel. 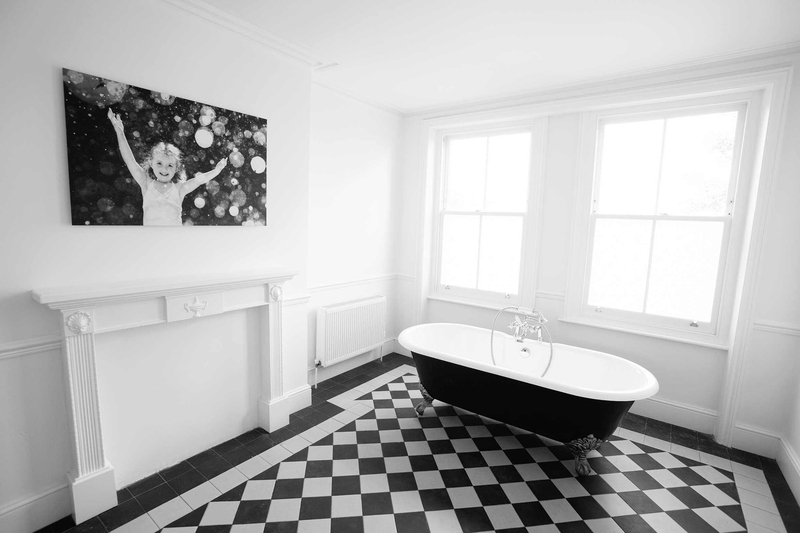 Being able to request an image or file from a client is useful in lots of situations, such as asking a client for a picture of a room they want to hang wall art in for a viewing session. Warning: although we’re not allowing image or file uploads in contact forms, you should always treat files that have been sent to you by anyone else with a certain amount of caution! Added a setting to contract templates that allows you to choose whether (and which type of) booking fee you want to charge for that contract. Added support for separate Stripe and PayPal details for each client portal brand, so you can have payments going to separate accounts for different shoot types. Please get in touch if you might be interested in this feature. We’ve added an option to not CC you into client portal emails that we send on your behalf (e.g. when a contract is published, etc). Incoming data sent to your account via Light Blue’s API now includes a date field that you can use in queries. You can now import Fundy Design Suite orders into Light Blue. You’ll find commands for importing Fundy files in the Import section of the Records menu. Upgrading Light Blue’s database is much, much faster than before. In our tests with large databases, it’s now 20x faster to upgrade your database. Loading the Inbox and Outbox is now much faster when they contain large numbers of items. The Outbox date filters have been changed so that you can more quickly find what you’re interested in. The “Today”, “Yesterday”, “Last 7 Days”, and “Last 28 Days” options no longer display messages scheduled to be sent on future dates, and you now have “Tomorrow”, “Next 7 Days”, and “Next 28 Days” options that will show you scheduled messages. The default option is now “All Dates”. Added “Create Enquiry” and “Link To Existing Record” buttons to emails opened up from the Inbox, to save you needing to close the dialog and use the buttons in the Inbox. When you’re previewing incoming data (e.g. from a contact form) that includes an email address, a new “Reply” button allows you to create an email to the first email address included in the data. Text messages that you open from the Outbox now display their linked record and can be linked to a different record. You can now export a set of invoices in a format that is easier to import into QuickBooks. We’ve improved the “Issue Credit” button on invoices to make it easier to credit or refund a wider variety of invoices. You can now choose to include the Payment notes field when printing a receipt. You can now choose to include the shoot type on a printed invoice or quote. Added an option to display week numbers in Week and Month view. We’ve added an option that allows you to display cancelled shoots in the built-in calendar. We’ve added an option to include cancelled shoots in the results of quick searches. This is turned off by default, to avoid cluttering your search results with cancelled enquiries unless you’re specifically searching for one. The various data export commands that used to live in the File menu have been moved to a new “Export” sub-menu in the Records menu. This is a more logical place for them to live, is more consistent with the “Import” sub-menu, and removes clutter from the File menu. The list view now remembers any column widths that you manually adjusted, and restores them when you go back to that list. In list view, selecting a quick query that doesn’t include any records no longer takes you back to detail view. In the query dialog, you can now query on the “role” of resources linked to a shoot. You can now use “Invoice Number (without prefix)” and “Invoice Number Prefix” in the query dialog, lists, and data exports. You’ve always been able to use the full “Invoice Number” field in these situations, but these new options give you more flexibility. We’ve added new fields that you can use in queries, lists, and data exports: “No. of Confirmed Shoots” has been added to the Contacts section, “First Appointment Start Date” has been added to the Shoots section; and “Shoot Start Date” and “Most Recent Payment Method” have been added to the Sales section. When you’re running a report, the report options dialog now defaults the most recent reporting period and output options to the options that you used for that report. Calendar notes are now included in the “Today’s Information” report. Google are making a small but important change to their Google Calendar API, and Light Blue 8 is now ready for this change. Improved the design of the staff login window to make it more welcoming when you launch Light Blue, as well as clearer in its purpose. We’ve updated the APIs that we use to publish contacts to the macOS Contacts app, which makes publishing contacts much faster (and future-proofs this feature in case Apple decides to stop supporting their old API). This requires macOS 10.11. You can now import individual contacts from the macOS Contacts app, as well as importing an entire group of contacts. Added a housekeeping command that marks any Sale records in the current found set as paid. Notes fields on Windows now have spell-checking enabled. Added a timezone setting to the Preferences window and setup wizard. This allows us to implement the %CurrentDate% and %CurrentTime% mail-merge tags in workflow messages. Added %ShootAcceptedQuoteTotal%, %ShootNetAcceptedQuoteTotal%, %ShootPaidTotal%, and %ShootOutstandingBalance% mail-merge tags. We’ve made our German localisation more comprehensive, and included both formal and informal options to give you a choice as to how formal you want to be when printing invoices, sending contracts, etc. When you set up a new database, we now create a default email signature for you. When you’re merging two contact records, spaces are now ignored when deciding whether to deduplicate a phone number. When linking a shoot to a purchase item, the “new record” button shouldn’t be available. The field label for custom paragraph text fields can now wrap onto extra lines if the label you’ve specified is long. Fixed a bug where duplicating time off wouldn’t publish the duplicated event to Google Calendar or the macOS Calendars app. Fixed a bug where printing a single record from the list view could print the wrong record. Fixed a crash that could occur when trying to attach a PDF of the built-in calendar to an email. Fixed a database error that could occur when using an unusual combination of related sections in the query dialog. Fixed a bug where shoots created via the API might not use their shoot type’s default session length. Although we’re still hard at work here in the Light Blue bunker this week, we thought we should take some time out to let you know when we’ll be available to help anyone who’s going to be busy over the Christmas and New Year period. Whether you’re a wedding photographer who’s looking forward to dealing with all of the new enquiries that tend to come in after Christmas, or just someone who’s using Light Blue to maintain their ‘Naughty or Nice’ list, we’re here to help. We’re going to be taking a bit of a break though, so we won’t be answering emails quite as quickly as normal between Christmas and New Year. We’ll be offering our normal email support hours until Friday 21 December. We’ll be offering limited email support on Monday 24 December. There’ll be no email support available on the UK holidays of 25 & 26 December. We’ll be offering limited email support 27, 28, and 31 December. There will be no email support available on the bank holiday of Tuesday 1 January. Normal email support will resume on Wednesday 2 January. We’d like to take this opportunity to wish all of our customers a restful and enjoyable Christmas, and best wishes for a successful and prosperous 2019; thank you so much for choosing Light Blue. After lots of hard work here at Light Blue HQ, we’re very excited to announce that we’re launching a public beta of Light Blue 8 this week. Light Blue 8 is a major upgrade to our desktop app. We’ve added new automation features and made lots of improvements to Light Blue’s email and text messaging features, helping you to book more shoots, cut down on no-shows, and free you up to spend more time on delivering great images to your clients. We’ve also added new features to Light Blue’s client portal, and added lots of other changes that will help you to run a successful business. If you subscribe to our online services, we’d be delighted to give you access to Light Blue 8 before its official release in January. You’ll be able to use all of its new features while we’re putting the finishing touches in place for the final release. To find out more about Light Blue 8, get access to the beta, and learn how it can help you to be even more organised, please join us for one of our Light Blue 8 beta webinars. Sign up using the links below!